Environmental sustainability at IHS Markit includes efforts to minimize our environmental impact and identify areas for improvement in our operations and in our communities. We make choices that help to reduce waste and our carbon footprint, increase operational efficiency and enable our colleagues to support a healthy planet. This means we go beyond simply compliance with environmental regulations, and instead, strive for leadership and innovation throughout our business. As a professional services company, our impacts are largely due to office and data center operations, travel and our supply chain. Therefore, we are committed to incorporation of sustainable design in new projects and remodels, and further, are investing in LEED certified or equivalent certifications. We are also committed to consolidating our data centers, increasing virtualization and increasing transparency across all aspects of our supply chain. As part of our commitment to Climate Action, IHS Markit signed on to the RE100 in 2017, with a commitment to Renewable Energy by 2020, and joining in the We Mean Business coalition of companies committed to Climate Action. 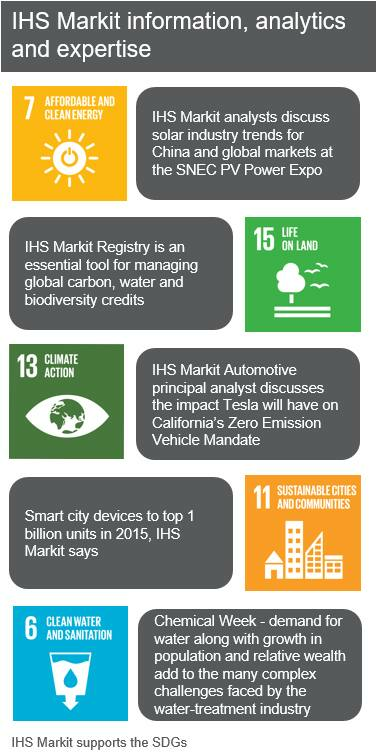 IHS Markit reports into the CDP annually, and we continue to pursue opportunities through environmental efforts that advance progress in support of sustainable development goals #12-Responsible Consumption, #13-Climate Action, #14-Life Below Water and #15-Life on Land. 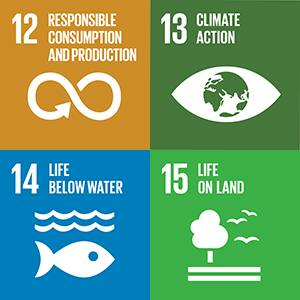 Check out the sustainable attributes and recognition that our global offices have received. In support of our IHS Markit Sustainability Policy and our commitment to the Climate Action Goal of the United Nations Sustainable Development Goals, our goal is to reduce our environmental impact and increase the energy efficiency of our office spaces. We have signed on to RE100, committing to sourcing 100 percent of electricity from renewable energy by 2020. Through its RE100 commitment, IHS Markit is now part of the We Mean Business coalition of more than 700 companies and investors committed to climate action. In 2017, IHS Markit also generated 552 metrics tons of scope 1, direct greenhouse gas (DGHG), emissions (a 18 percent reduction when normalized for revenue). 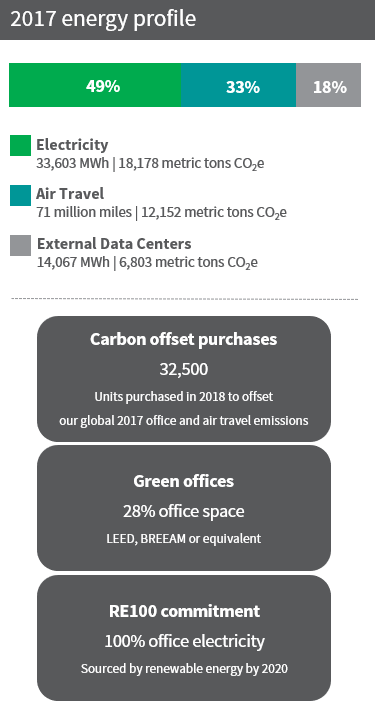 These emissions represent 100 percent of owned IHS Markit office space and 13 percent of all IHS Markit office area, both leased and owned. We report DGHG emissions only for locations that we own and only when we have full operational control of the direct emissions in the building. We do not report energy usage for corporate vehicles since their carbon impact is not significant when compared to our other GHG emissions. 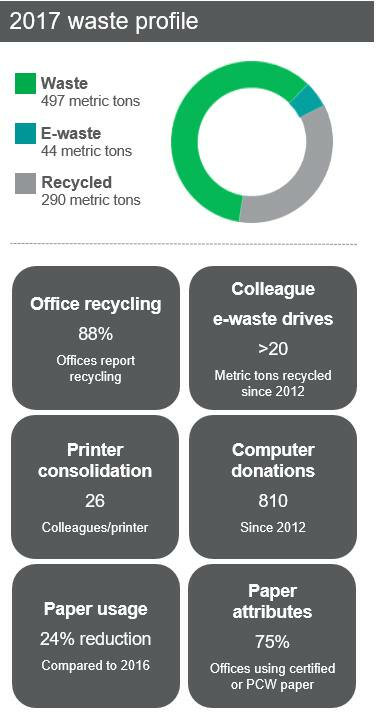 IHS Markit continues to reduce overall waste and our environmental impacts by recycling and improving waste service efficiency. For e-waste, our vendors meet strict environmental standards, including e-stewards, R2 ISO 9001 and/or ISO 140001 certifications. Further reducing our impact and risk means making responsible choices regarding our vendors and providing solutions to customers that advance their sustainability goals. Check out our Vendor Code of Conduct to see the acceptable conduct we expect from all our suppliers. For customers, sustainability can be a organizational imperative and driver for growth and innovation. Working with industry leaders or non-profit agencies - on both paid engagements and pro bono projects - we provide customer solutions that harness information, analytics and expertise to address sustainability challenges throughout organizations around the world. Since 2013, IHS Markit has used an external provider to better understand our environmental footprint. Due to lack of customer participation, we moved away from this provider and are in the process of incorporating environmental and social assessments into our internal vendor management system. The goal is to obtain a more detailed profile of our top vendors and to have better control of potential risks. All new IHS Markit office fitouts strive to be designed to BREEAM/LEED-certified standards. Everything from the materials used to the overall design of the space is carefully considered in terms of its impact on the environment including the purchase of low emitting amd recycled content material, low emitting VOC paint, water efficient devices, and ENERGY STAR rated equipment. Our goal is to incorporate sustainable design in 33% of the projects we undertake in 2018. For the past few years, IHS Markit has partnered with Xerox in an enterprise-wide strategy to reduce our environmental impact and increase productivity. Please see the case studies for our offices and our centralized print shop. Konica Minolta, our current supplier, has a strong committment to the environment including the use of eco-friendly plastics, bio-based toners and energy saving technology in their printing devices. For example, their C658 model is made up of 35% recycled material and ENERGY STAR certified with duplex printing set as default and one touch control of power consumption. We estimate that over 50% of our data center footprint is sourced by renewable energy or has been recognized for carbon reduction or energy efficiency: ViaWest has been recognized as Xcel Energy’s 2010 Cooling Efficiency Champion and for leading the Rocky Mountain region in its utilization of green technology; Century Link received Carbon Trust Standard recognition in 2013 for their LO6 data center that IHS Markit uses; Equinix uses 100% renewable energy for their data centers we use in London and Amsterdam. Our corporate supplier of desktop computer hardware is Dell, a company with a strong commitment to the environment. Currently about 50 percent of our computer inventory is ENERGY STAR™ compliant. We project that we will be at 70% inventory by the end of 2018 and at 100% in the next couple of years as we exchange out our legacy Markit equipment. Our preferred airline carriers, United Airlines and British Airways, are committed to leading commercial aviation in reducing their footprint in the air, on the ground, and at their facilities. Travel with these preferred carriers represent over 39% of all IHS Markit air travel spend. To reduce air travel, we invest about $2M annually in collaborative tools such as Skype and WebEx. We average more than 20,000 hours per month in WebEx usage. We also continue to contract with and drive use of green travel suppliers to reduce the impact of corporate travel. In 2017, 45% of employee hotel stays were at green hotel properties. In 2018, our goal is for 50% of stays to be at green hotels. Environmental and social data is collected each fiscal year and audited internally. We track more than 50 key performance indicators (KPIs) in alignment with and based on the Global Reporting Initiative (GRI) G4 reporting guidelines. We are now in more than 5 years of tracking environmental metrics, with improvements every year in the availability and access to information, and in our environmental performance. Our data is managed centrally, with inputs from colleagues around the world, our global "sustainability champions" who are leading local efforts at local offices, and from our internal business functions. Data is aggregated up to the regional and corporate level for quality control, audit and evaluation. More than 75% of our business operations are captured in the environmental and social indicators we report.